Even with its $1 billion endowment, Middlebury College announced voluntary buyouts last year in an effort to save $8 million in staff salaries to close an operating budget deficit amid higher education struggles in Vermont. Green Mountain College and the other higher education institutions sprinkled across Vermont have felt as permanent as the mountains and valleys they stand on, but that ground is shifting quickly. Higher education is the third-largest industry in Vermont, yet the state faces a particularly acute version of the challenges that threaten the industry nationwide. It has the most colleges per capita yet one of the fastest-declining high school populations in the country — offering a sobering look at what might be in store for the rest of the nation. With its announcement last week of impending closure, Green Mountain has become the face of this existential struggle, but many other colleges in Vermont are more quietly staring down the same problems. “There is no doubt that we’re living in a time of profound, disruptive change in higher education,” said Tom Greene, chairman of the Vermont Higher Education Council, an association of all the college presidents in the state. Greene, who is also founder and president of the Vermont College of Fine Arts and served until recently on the regional accreditation agency, said more schools are likely to close in New England, possibly in Vermont. The school in Poultney, Vt., cited financial pressure stemming from declining enrollment in deciding to close after the end of spring semester. “Some of it is demographic, some is climate, some is fundamentally you have an education system that was built in the 19th century,” he said. Vermont has 21 public and private colleges and universities, a lot for a state with just over half a million residents. 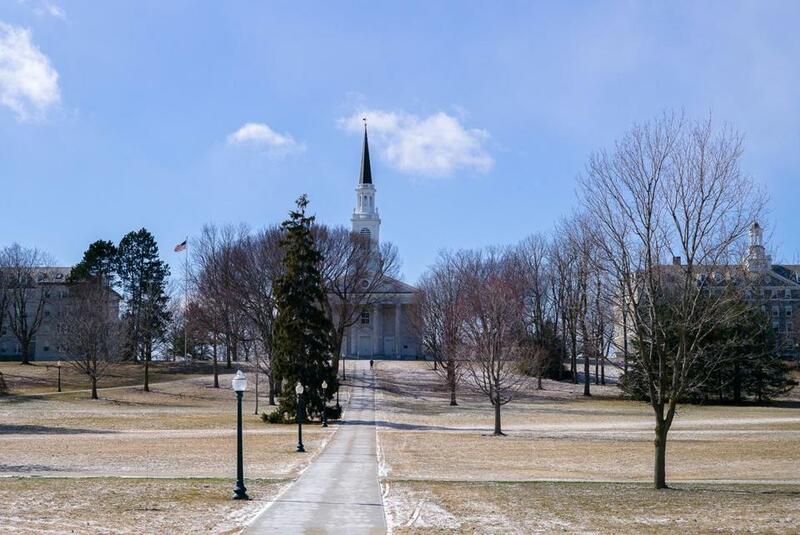 In addition to a network of public colleges and universities, there is elite Middlebury College, Norwich University military academy, quirky Goddard College, and a smattering of other private liberal arts colleges. All have experienced in some way the repercussions of the population trends. Much of the problem comes down to simple math. Enrollments are dropping, and costs are rising. The College of St. Joseph in Rutland has 32 percent fewer students now than a decade ago. The school is set to lose its accreditation at the end of this semester if it does not remedy its financial problems. Goddard, in Plainfield, is on probation with accreditors, also for financial problems. Vermont Law School revoked tenure for three-quarters of its faculty this year as part of an effort to plug a budget gap. Marlboro College, where enrollment has dropped 26 percent in the last 10 years, sold a building. Even Middlebury, with its $1 billion endowment, announced voluntary buyouts last year in an effort to save $8 million in staff salaries to close an operating budget deficit. Schools have closed before. Burlington College shut its doors in 2016 after controversy that began with its purchase of a much larger campus it ultimately could not afford. Trinity College of Vermont closed in 2000; Woodbury College, in Montpelier, merged with Champlain College in 2008. The situation in Vermont is particularly important because it is something of a harbinger for what might be in store for the rest of the country. The state has led the nation in low fertility for more than a decade, according to Nathan Grawe, a professor at Carleton College in Minnesota and national expert in how shifting demographics will affect higher education. Today, the US fertility rate is just slightly higher than Vermont’s was a decade ago. The national decline is also relevant for Vermont, because 60 percent of its college students come from other states. Experts predict that the number of high school graduates nationwide will stagnate in the next few years, after 15 years of steady growth. Then, after 2025, this population will begin to drop. In Vermont, however, the population of high schoolers has been dropping since 2008 and is expected to plummet further. From 2000 to 2017, the number declined from 36,000 to 31,000, according to state data. Public colleges in Vermont face challenges, too. The state system receives the least amount of state aid per student in the country, making public schools nearly as dependent on tuition as private colleges. The University of Vermont, in Burlington, has addressed this shortfall by attracting a large number of out-of-state students, about three out of four undergraduates. The state’s community college network plus its technical college and two regional universities, however, educate a large number of Vermonters, who must make up for the state’s negligible contribution from their own wallets. Amid declining enrollment, two regional colleges, Lyndon State and Johnson State, merged last year into Northern Vermont University, a budget-saving measure that officials said has already proved effective. Jeb Spaulding, chancellor of the Vermont State Colleges System, said the system is searching for more efficiencies as well as ways to reach new students. This includes apprenticeships, online programs, shorter semesters, weekend classes, and non-degree credentials for people who need job skills. In Vermont, about 42 percent of high school graduates do not go on to college, and that percentage increases to 63 percent among economically disadvantaged students. Spaulding said that simply reaching those people is another way to increase enrollment. When Green Mountain College’s president announced its closure last week, he described the attempts that officials had made to keep it in business. But ultimately, he said, it was most responsible to close. The loss will affect more than just the students. Higher education employs more than 12,000 people who are paid more than $589 million total annually, according to a 2017 report by the council Tom Greene chairs. Schools like Green Mountain also bring money to local communities. “It’s a big impact when a college closes,” he said. Greene said the schools best-equipped for success are those with unique specialties that differentiate them from the many mid-tier liberal arts schools. That includes Norwich’s military training program, Sterling College’s agriculture program, or Greene’s own school, which specializes in low-residency graduate degrees in writing, art, and film. Goddard College runs an unusual low-residency program that lets students come to campus for a week at the beginning of each semester then complete the rest of the class online. But Bernard Bull, who started Nov. 1 as Goddard’s president, said he is candid with anyone who asks: His school is in trouble. “I tell people our future is not certain, but we are committed to doing everything we can,” Bull said. Bull worries that school closures will kill the diversity of the college landscape. “It grieves me to think that we are moving to a higher education ecosystem that is less diversified, and that means there is going to be less access and opportunity for people,” he said. be reached at laura.krantz@globe.com. Follow her on Twitter @laurakrantz.